We bought our first Miata in April and immediately joined the Mass. Miata Club. Though we’ve taken part in several meets and cruises this summer, this was our first overnight event since we had to cancel our participation in the May Smuggler’s Notch trip when Paul had emergency surgery. So you can imagine how much we looked forward to this! Saturday dawned very overcast, but when we met the caravan at the second rendezvous point near the Bourne Bridge, we dropped the top to enjoy the breeze. Traffic wasn’t bad at all despite the holiday weekend, and we made good time to the Lawrence School in Falmouth. The Miatas’ spot was marked with a little Japanese flag, and we shared the field with lots of other small two-seat sports cars and performance coupes and sedans. There were lots of Corvettes, a Viper, a Lotus 7, Maseratis, two Ferrari GTs, a GTO, Triumph TR8’s and TR 4’s, a rare Austin Saloon, Austin Healey Bug-eyed Sprites, Austin Healey Mark 2 and 3, a 911 Carrera Porsche, MG-B’s, MG TCs, and more. Those nostalgic for our youth in the 70’s admired a bright yellow AMC Pacer. Paul got a kick out of a 1956 Buick Roadmaster convertible, the same model car he owned as a teenager. 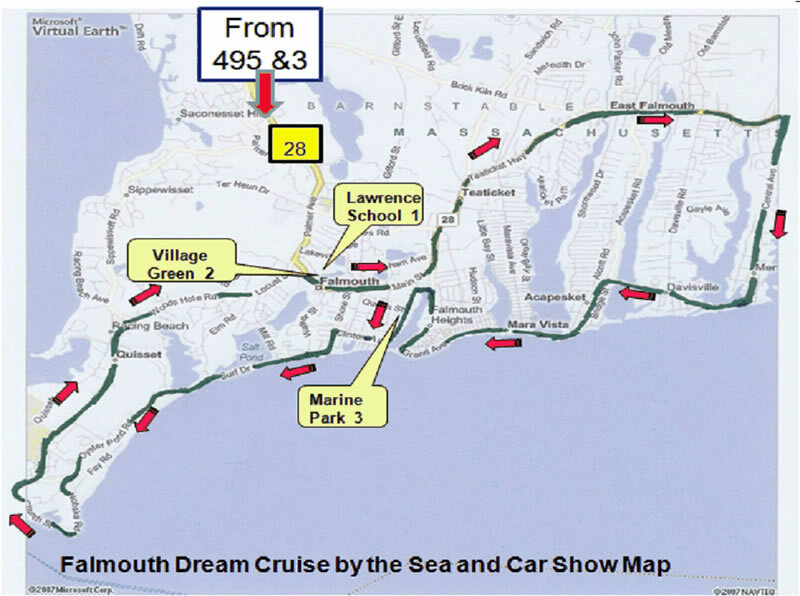 The overall show was divided into three fields, with pre-World War II cars such as Packards on the Village Green and muscle cars and hot rods by the harbor. Since the show was informal and not judged, Bob Baylis was encouraged to put a “for sale” sign on his 1997 black Miata. A local couple expressed interest and Bob persuaded them to take a test drive. We knew the sale was made when they drove back to the field with both husband and wife grinning from ear to ear. From what we understand, they intend to join the club. The rain stayed away all morning. Midday brought a couple of showers but that didn’t deter our enjoyment, and after several months of Miata ownership we’re getting much quicker at putting up the top. Part of the group took a stroll through the downtown area and, in true Mass. Miata fashion, took shelter from one shower in an ice cream store! In mid-afternoon we drove a few blocks to the host hotel, the Shoreway Acres Inn, which had a lovely wine and cheese welcome party under a big tent. Rich had made early dinner reservations for us at Liam Maguire’s Irish Pub and Restaurant, a very lively and tasty spot that was a short walk from the hotel. After waddling back from dinner, we caravanned to the Barnstable County Fairgrounds for the “Pops Goes the Summer” concert by the Cape Cod Symphony. We had VIP parking and free admission–at least after being shaken down to buy event t-shirts! The special guest was Broadway star Jodi Benson, the original Ariel of “Little Mermaid” fame, who belted out wonderful songs from several shows. It was great fun to sit on the lawn surrounded by families enjoying a late summer outing. Kids with glow sticks lit up the night, providing a hint of the spectacular fireworks show that immediately followed the concert. The rain stayed away but there was enough high cloud cover to give an ethereal effect to the fireworks, quite striking. Sunday brought spectacular weather with sparkling sunshine and no humidity. 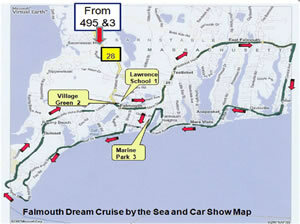 After breakfast, we drove the 20-mile “dream cruise” route, which followed the coastline around Falmouth. The route is shown below. We drove by beautiful harbors, lighthouses, views of Martha’s Vineyard, and windy roads through woods, and took a short stroll on a pretty beach. After taking group photos in Falmouth Village, we ended the trip with a quick stop at the lovely home of Rich’s cousin Tony DeMambro, one of the event organizers. We admired Tony’s 2003 modified Z06 supercharged Greenwood Corvette and spouse Judy’s Carnival and Depression glass collection. The “official” cruise ended at that point and some folks had to depart for home. The remaining three couples hadn’t had enough of the Cape, though, so we browsed the shops in the Village and had lunch at the Villaggio Italian Restaurant on Main St. The beautiful weather brought in many classic and collector cars for the cruise, providing us with a great show as they passed through the shopping district. After lunch we drove through more pretty back roads in North Falmouth and Bourne, ending with a stop at the Cape Cod Canal underneath the depression era vertical lift railroad bridge. Kudos to Rich and Carolyn Mariani for planning a great weekend. This was a wonderful way to end the summer, and we look forward to the next trip!